I kind of have a lot of cookie cutters. I could probably melt them down and make a model version of the Taj Mahal that would actually fit people inside it. I mean... it might be a little cramped. And it probably wouldn't hold up in bad weather. In fact, it would be a downright liability if there was a tornado. Also...if I did that, I couldn't use them to make cookie cutters anymore. So I didn't. Because I like cookies. But also because I'm not actually capable of recreating the Taj Mahal out of tin and plastic. So I decided to give some of my cutters away. (Gasp!) What? Don't you gasp at me. You all know you've got cutters piled away that you probably won't ever use. Or cutters in triplicate because you just keep forgetting you already own it and buy another one. Here's the funny part though. 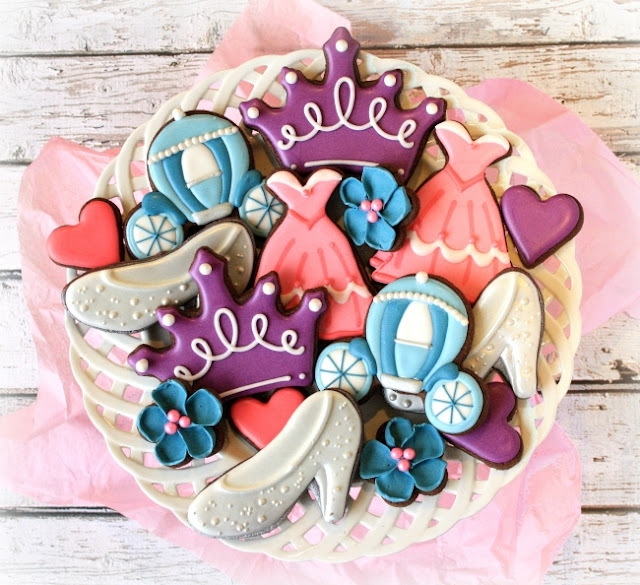 I looked at my box of princess cutters and thought to myself-- "Self *these* are some cutters you will never use." And I promptly gave away 85% of them. And then a week later, I realized I have THREE little girls living in my house. And they have SIX little girl cousins and THIRTY-SEVEN little girl friends. And my self said, "Oops." 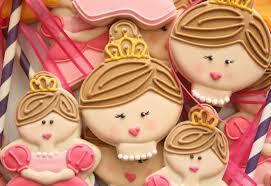 So when the occasion arose to whip up some princess cookies for one of those little girl cousins... I had to get a little creative with the carriage. Can you guess what I used? I bet you won't guess so I will just tell you. I used a Mickey Mouse pancake shaper. You might have guessed the Mickey Mouse part on your own. It's uh...not really a complicated shape, is it? 1. 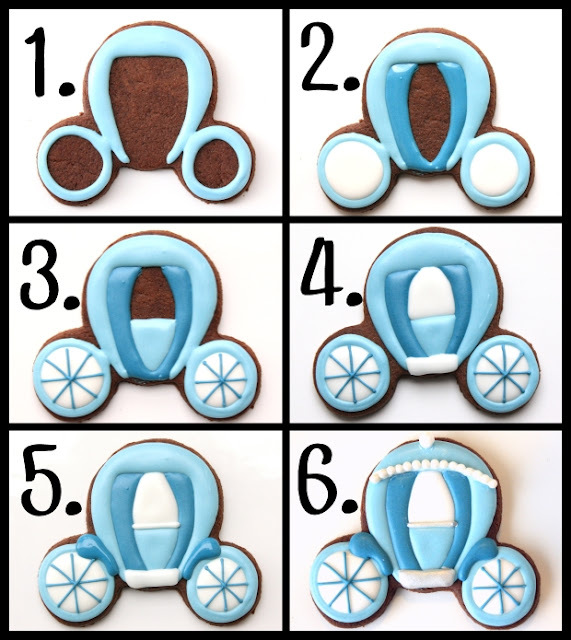 Use a medium consistency light blue icing and a #3 tip to give the carriage wheel and pipe an upside down "U" shape that makes this carriage look like it's wearing a helmet. Let the icing set. 2. Add darker blue stripes with medium consistency icing and a #3 tip. Flood the wheels with white icing. Let it dry for 20 minutes. 3. Use the light blue icing to fill in the door of the carriage. Put a #1.5 tip on the dark blue icing and pipe some spokes on the wheels. 4. Use the white icing to fill in the window of the carriage and to pipe a small step on the bottom. 5. Add fenders with the dark blue icing and a #3 tip. (Do carriages HAVE fenders? I think they should.) Pipe a line across the bottom of the window with thick white icing and a #3 tip. 6. Pipe a line of icing across the top of the carriage and immediately cover with sugar pearls. Add a larger pearl at the top and you are done! Make these perfect little princesses with Callye at The Sweet Adventures of Sugarbelle. 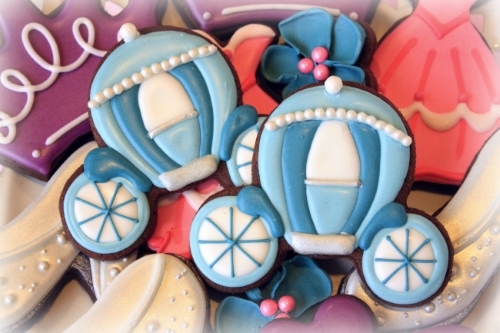 Find out how to make these princess crowns with Lisa at The Bearfoot Baker.